Have you heard of blue light blocking glasses technology? Supposedly, it's a way to help restore sleep hormone balance to your body. It is also supposed to improve the quality of sleep you get each night. Our product testers stumbled across a set of anti blue light glasses from Dream Elements, and decided to investigate. We took a good, thorough look at the claims they make, the efficacy of these glasses, and the price they sell them at. Based on all of these criteria, our review should give you all the information you need in order to make an educated decision as a consumer about these glasses. The human body has, overtime, evolved to sleep and wake around a certain rhythm. This is called the circadian rhythm. It compels our bodies to wake up when the sun rises, and feel sleepy when the sun sets. Part of this process involves releasing melatonin, a powerful sleep hormone, when the sun goes down. It's something your body has done all your life. But if you're having any trouble sleeping, it may be a sign that your body isn't producing as much melatonin as it should during the final hours of your day. The number one cause of this decreased melatonin production is blue electronic light. The most common sources of this artificial light - especially after dark - are things like computer monitors, television screens, tablets, and smartphones. Specifically, these devices emit a lot of light on the blueish side of the light spectrum, which tricks your brain into thinking the sun is still up. And if your brain believes that the sun is still high in the sky, your body won't produce melatonin. It should come as no surprise that people who log a lot of hours on the computer or the TV in the evening have the highest number of sleep problems. Unfortunately, turning off all electronic devices at night isn't a very realistic solution for most people. So what should you do? Is there a solution to this problem, other than taking dangerous drugs which force your body into feeling sleepy at bedtime (even though they can do more harm than good in the long run)? In order to solve this problem, medical experts came up with blue light blocking glasses, and they do exactly what the name says they will. But not all of these frames are created equal. 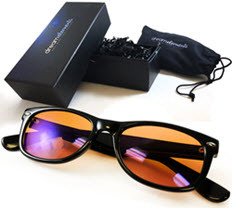 Our product review experts have found that the Dream Elements anti blue light glasses have some of the most stylish and affordable glasses available for purchase today. Furthermore, anti blue light glasses aren't just about helping you sleep at night and getting better rest. They can fix one other very important health problem, too: eye strain. These days, everyone is surrounded by electronic devices, large and small, on a nearly constant basis throughout the day. Beyond that, most people spend at least a portion of their nine to five staring at a computer monitor, inputting data into a touch screen, or even conducting business on their smartphone. But excessive daily use of electronic devices, especially as you age, can lead to eye strain. Symptoms of eye strain are most frequently noticed in, well, the eyes. Your eyes may become dry, itchy, blurry, and you can even experience double vision in advanced cases. Next come the headaches. The longer you spend staring into a blinding white computer screen, the more acute these headaches will be, and the longer they will last. Most people with eye strain also develop a lot of tension in their neck, shoulders, and upper back. No matter how your eye strain symptoms manifest themselves, we can virtually guarantee that they are having a negative effect on your quality of life and your ability to function throughout the day. Thanks to blue light blocking technology, like that in the Dream Elements anti blue light glasses, you can give your eyes a break and reduce the symptoms of eye strain. Some people notice benefits as quickly as their first use, while more severe cases of eye strain may take longer to correct. But the vast majority of people who use blue light blocking glasses for computer use do report a significant improvement in their comfort levels. Obviously, there are many different brands of blue light blocking glasses on the market today. Some incorporate very high quality lens technology, but at a premium price. The more affordable glasses are either downright ugly, ineffective, or both. But you won't have to worry about any of those things with a pair of Dream Elements anti blue light glasses. The frame is not only constructed from extremely sturdy materials, but it comes in a simple, sleek design which will fit into any aesthetic look - they're basically the "little black dress" of eyewear. And the advanced lenses that Dream Elements uses have a whopping UV 400 rating. It's hard to find that in most prescription lenses or high-end sunglasses! The bottom line: if you want to improve the quantity and quality of rest you get each night, but you can't tear yourself away from your electronic devices, then blue light blocking glasses need to be a part of your new sleep routine. Of course, natural herbal sleep remedies will help too. And when you pair them both together, you can experience some truly fantastic results. You can buy these glasses on Amazon or DermBoutique.